I have a problem. I love books. I mean I really, really love books. For me, going into a bookstore is almost as dangerous as it is for a gambling addict to go into a casino. Maybe worse. I can walk in fully intending to buy only one specific book, and walk out with, well, a lot. Or, go online to order one and all of these other “suggestions” start popping up! Oooooo, the rush! I own a lot of books, and I keep buying more. I can’t stop, I don’t want to, and you can’t make me. My love affair with books started very early. My parents were avid readers. What they read, like Reader’s Digest condensed stuff, held little interest for me, but they set an example. Mom especially as she would stay up all hours reading, eager to get to the end of one story after another. I loved being read to; Dr. Seuss and Charlotte’s Web were favorites. While I can’t recall exactly how old I was or what grade I was in, I can remember the moment when I knew I could actually read on my own; no more training wheels. It was recess at Sunnyside Elementary in New Castle, Indiana. One side of the asphalt playground wrapped around the kindergarten room where books were always displayed face-out in the windows. As I walked by on that day one book trapped my attention. It was a kid’s book that I don’t believe is in print any longer. The title was Even Stephen. Okay, sure, that’s my name and I should have been able to recognize it. But this was different. It was like a jolt of electricity zotted into my brain and I knew that I was reading the title, not just recognizing it. There was a new intimate comprehension of words that hadn’t been there before. From that moment on I was hooked. I love the feel of books. I love the smell of a book, new or old. Mmmmmm, yes.... Oh, sorry. Every trip to the school’s library became an adventure, although I hated that they forced us to choose books only from our “age appropriate” section (a practice that later contributed to my leaving libraries behind). At recess, instead of running around “getting exercise” I’d sit leaning against the building and read, that is until the teachers monitoring the playground took my book away and made me go play! Aargh! First they work so hard to teach me how to read and then they deny me the privilege. Very frustrating. I think it left an emotional scar or two and probably explains why I don’t care for sports. I went through reading phases, absorbing one category at a time. I would read only science fiction for months, then suddenly switch to detective/mystery/spy novels, or maybe war stories, or mythology, and of course all of Henry Gregor Felson’s car classics. Delicious! Disappearing into an other world of a good novel is still way better than drugs; but then I never did drugs so I’m not sure how it compares; I just know that I like the I-can’t-hear-you-I’m-engrossed-in-a-good-book experience a lot. When pocket books were the rage and cheap I always had one in the hip pocket of my jeans. Any “down time” was an opportunity to read and fade away to another place and time. I liked poetry, too. As my reading tastes became more sophisticated, I tossed Rod McKuen and Kahlil Gibran aside picking up real poetry, and was swept away by e. e. cummings, W. H. Auden, Robert Frost, T. S. Eliot, and more. In fiction, I moved on to John Steinbeck, John Knowles, Ernest Hemingway, F. Scott Fitzgerald, John Cheever, Kurt Vonnegut, Ayn Rand. Then, finally, in college, I discovered John Updike. I was smitten. My first exposure was to his short story “A&P” in an English Lit. class. I was entranced and even wrote a poem based on a classroom discussion of the story. I recently discovered echoes of the story in the song “Queen of the Supermarket” on Bruce Springsteen’s album, Working on a Dream. I headed to my favorite bookstore at Battlefield Mall in Springfield, Missouri and the first two novels I read were The Centaur and Of the Farm. Of all of Updike’s books (I have them all, many in hard cover first editions) my favorite is Couples. And of course, the Rabbit books, especially Rabbit, Run. Even if you aren’t sold on the story line, the writing enthralls. I pray earnestly daily that I would be gifted to write even a third as well as he did. Or better. Over the years other writers that I came to love have passed; most notably James Dickey and John Cheever. I knew it would eventually happen with Updike as well. While the little note about the author that appeared on the back pages of each of his books remained essentially the same (John Updike was born in 1932, in Shillington, Pennsylvania. He graduated from Harvard College in 1954…), his photo morphed as age made its creeping claim as it does to us all. Another thing I liked about Updike’s books is that he always included a note about the type used with a little description of the typeface. I’ve heard he often had a hand in how his books were designed inside and out. He loved books and book making. It amazes me that since that electrical moment on the playground distant decades ago, that beyond merely learning how to read books, I’ve had a hand in creating them, from writing to editing to designing. No bestsellers yet, but some pretty good books. It is both humbling and satisfying. I used to type out Updike’s stories, working to get inside his voice as I worked on finding mine. He’s had a hand in shaping me in more ways than one. On Tuesday, January 27th, I was walking by the vending area at Chancellor University in Cleveland. A flat-screen TV mounted on the wall is always tuned to one of the news channels with the sound off. I noticed John Updike’s face on the screen in one of those little sidebars previewing upcoming stories. A sad chill spilled into my heart as I grasped why he was pictured. He’d died. America had lost one of its great voices. I felt like crying. It was like losing an old friend. I needed to tell someone so tracked down the English profs, people who I knew would appreciate the news and my sadness, and we lamented briefly together. One even shared about his encounter with Updike. It helped to talk out the unexpected grief. I continued talking later with my cats and they purred empathy back. And so today, the posthumous collection of stories by Updike, titled The Maples Stories, arrived from Amazon; I had pre-ordered it months ago. It’s now on top of the stack of books next to my bed, queued up for reading. For years now whenever I’m in a bookstore I’ve always looked to see if there was something new from Updike that I’d missed hearing about. It’s sad knowing there won’t be from now on. But, there will always be new books by someone. Solomon lamented, “of making many books there is no end.” Sorry Solomon, but there is if you’re the one making them. Still, there are always new writers and new books, just maybe not quite as good as Updike’s. I will be saying good-bye to him for a long time, and will keep buying new books from new writers. 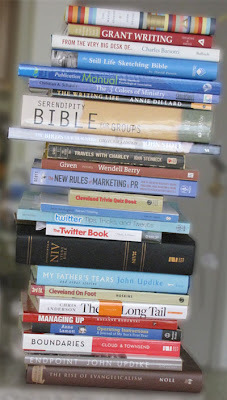 Now, if you’ll excuse me, there are books clamoring for my attention.